AUTOMOTIVE NEWS is an excellent weekly source of its industry’s happenings and trends. In particular, it has presented a variety of facts and opinions on electric vehicles. Here are a few tidbits gleaned from recent AN issues. 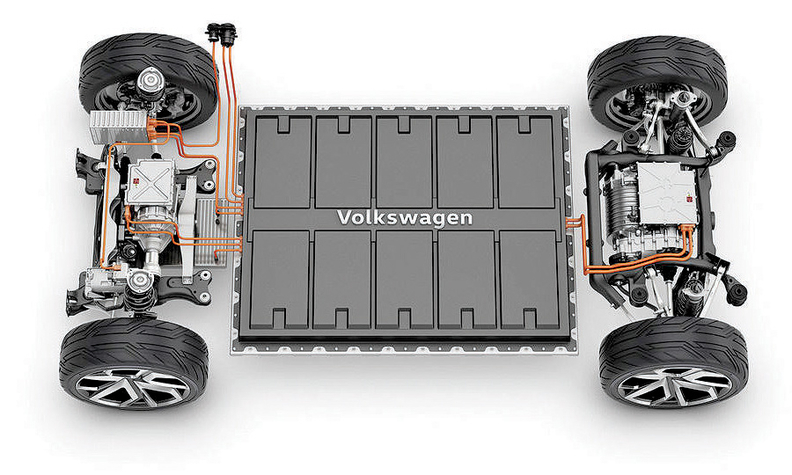 This VW MEB platform and its battery pack will underpin most of the company’s EVs. Image from Automotive News, March 4, 2019. Batteries with some life remaining will be given a second use as mobile charging stations. Others will be shredded into powder, with their raw materials extracted and recycled. Volvo Polestar 2, Chinese-built EV. Image from Automotive News, March 4, 2019. 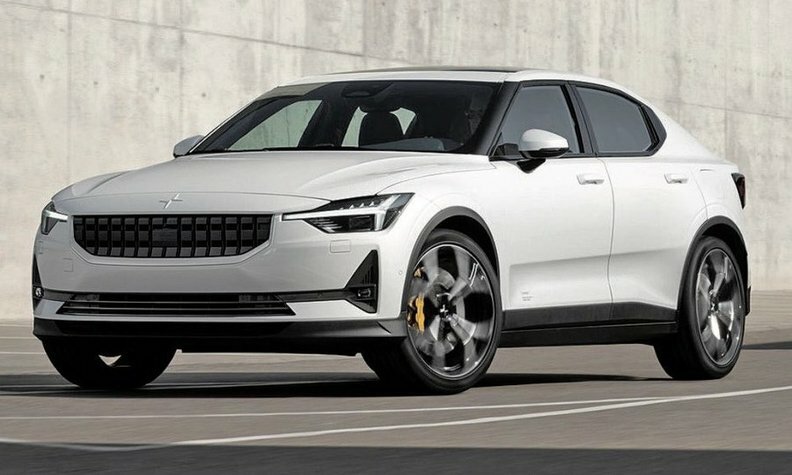 The Polestar 2 is powered by two electric motors supported by a 78-kilowatt-hour battery pack. The car is said to accelerate from 0 to 62 mph in less than five seconds. What’s Promoting EVs Sales? This spirited acceleration from near-instant torque is part of EV appeal, quite apart from any environmental benefits. However, most consumers still seem reluctant to give up fossil fuels. AN cites IHS Markit’s forecasts of sales and market shares of EVs, both battery electrics (BEVs) and plug-in hybrids (PHEVs). Images from Automotive News, March 4, 2019. Source: IHS Markit. Despite automaker hoopla, and EV’s non-trivial growth, its market share in 2030 is projected to reach only about 14 percent of sales, split about 8 percent PHEVs and 6 percent BEVs. 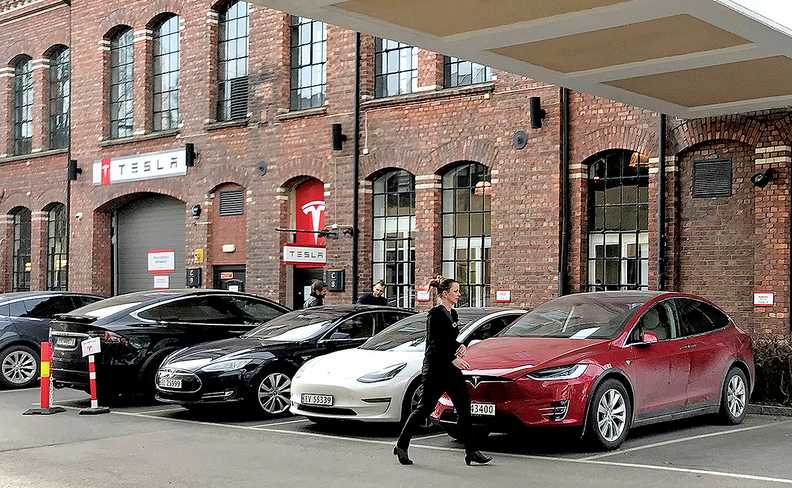 Teslas at its distribution center in Lillestrom, Norway. Image by REUTERS in Automotive News, April 8, 2019. The Tesla Model 3 “accounted for more than a quarter of registrations in March and pushed zero-emission vehicles to a record 58.4 percent of passenger-vehicle sales for the month, the Norwegian Road Federation reported last week.” This compares with last year’s rate of 31.2 percent and 2017’s 20.8 percent. Much of Norway’s EV success is government-engineered: Zero-emission vehicles get discounts in parking fees, road tolls, and ferry fares. Although Norway’s vehicle taxes are high, ZEVs are exempted. It is better if people can choose freely and not be coerced. NO ONE has a monopoly on truth and wisdom and neither does ANY ideology. Not “can’t” – “won’t.” There are perfectly reasonable ways to tax electricity used in a EV for road maintenance purposes. It’s politically impossible to generate a new tax (or even increase a nearly irrelevant, now, tax like the gas tax) at the national level. A few states have increased their gas taxes and imposed some modest (non mileage/usage based) fees on EVs, but a more reasonable setup is needed. Biggest problems now for EV’s seem to be limited recharging stations, time needed to recharge — and limited distances. All three issues were raised in a conversation with a Model S owner who bemoaned inability to use the car for anything other than local/area travel. 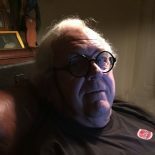 This entry was posted on April 15, 2019 by simanaitissays in Driving it Today, Driving it Tomorrow and tagged "A Milestone for EVs in Norway" (Tesla best seller in March 2019) "Automotive News", "Automotive News" on EVs, "Automotive News": Al European Hondas by 2025 electrified, "EV Recycling Project Targets Spent Batteries" Larry P. Vellequette "Automotive News", "Volvo's EV Takes On Tesla" Urvaksh Varvaria "Automotive News", "What's an Oil Giant to Do" Urvaksh Karkaria "Automotive News", EV torque = spirited acceleration, IHS Markit forecasts of EV sales and market share, Volvo Polestar 2.